What do bees eat and drink? Do bees only eat nectar from flowers? Do bees eat honey? Do all bees eat pollen, or are they doing something else with it? What about the diets of queen bees? These are the kinds of questions I am asked, so let’s set about answering these questions and more. Firstly, bees mostly eat and drink the pollen and nectar from flowers, but there are some differences in bee diets depending on the age of the bee and species, and there are also some exceptions to this general rule. For example, honey bees have been noted to eat over-ripe fruit, and they also make, store and eat honey. Bees may also eat sweet secretions from extra-floral nectaries of green leaf plants and shrubs, and may eat the sweet secretions of other insects, notably aphids. Bees are vegetarian..... mostly! But even here, there are exceptions in some parts of the world! 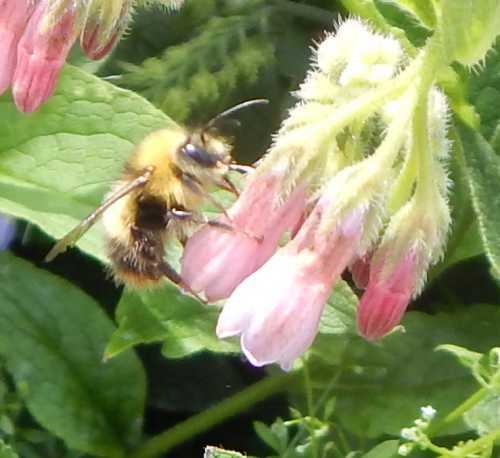 Most of us, however, think of bees feeding from the flowers of herbs, cottage garden plants and shrubs (though many trees are beneficial for pollinators too!). 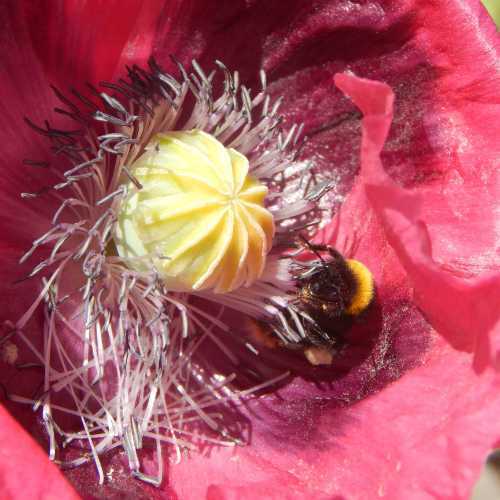 Firstly, why do bees eat pollen and nectar? Pollen is a rich source of protein for bees, whilst the sweet nectar provides energy and also helps to maintain water balance in the diet. Adults mostly eat nectar with a little pollen, though queens may consume more pollen, at least initially. Pollen (often mixed with a little nectar) is stored as food for larvae, and in the case of nectar, it is also made into honey by honey bees as a means of storing food for the winter. See: why bees need nectar and pollen. 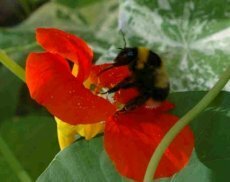 What do queen bumble bees eat? Queen bumblebees hibernate in the winter, although the rest of the colony will have died - it is the queens who ensure future generations of bumblebees. They will already have mated before hibernating. Some species emerge from hibernation early in the year. So, when queen bumblebees emerge from their winter snooze, the first thing they must do is find food to replenish their energy levels and sustain them as they establish their colonies. 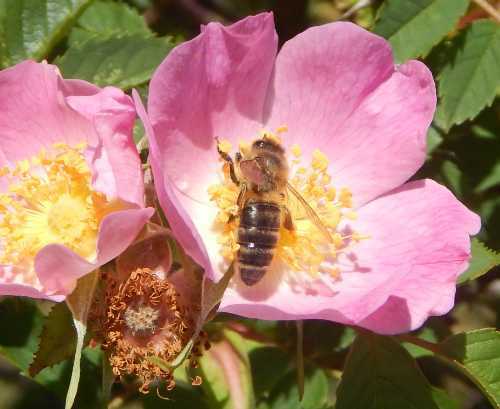 Nectar will provide lots of energy, whilst pollen is also very important because it is a rich source of protein for bees, and because it contains certain chemical compounds which help the ovaries of the impregnated queen to develop. As the queen establishes her nest for raising her colony, close to the brood cells, she builds a little pot made from wax, where she stores nectar that she will eat to sustain her whilst she incubates her eggs. 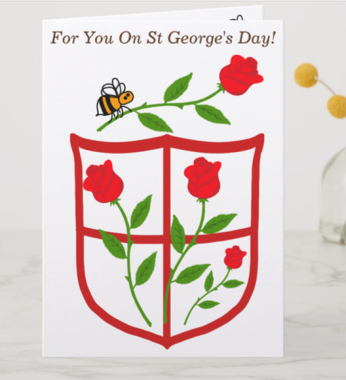 As the larvae develop, they initially eat pollen the queen has stored for them, but as they grow and develop, they eat regurgitated nectar and pollen fed to them by the queen and fully grown adult workers. 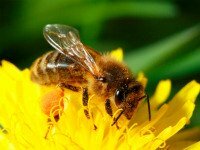 What do honey bees eat? Do honey bees eat honey? What do bees eat in winter? Honey is the natural food for honey bees, it being the winter stores made from nectar gathered by worker honey bees earlier in the season. See: why bees make honey. (Note that bumblebees do not store honey for winter as honey bees do. I discuss the question of whether bumblebees make and eat honey on this page). What else do honey bees eat? The main diet of honey bees is nectar and pollen, but then there is also royal jelly. Royal jelly is a protein-rich, glandular secretion – actually from the hypopharyngeal glands, which are a pair of long glands coiled in the sides of the heads of young worker honey bees. This substance is used to feed the larvae in a colony, and the amount fed to grubs depends on their future role (or caste). Grubs destined to become workers are fed bee bread (a substance made from honey and pollen) and just a little royal jelly, whereas those destined to become queens will be fed only on royal jelly. Drones (males) are fed a little more of this special food than workers. Fully developed Queen honey bees also feed on royal jelly as well as honey. Read more about royal jelly. 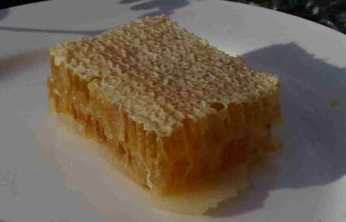 Bees kept by beekeepers may at times be fed sugar. You can read more about that here. Honeydew is a sugar-rich sticky liquid, secreted by aphids and some scale insects, as they feed on plant sap. When food is scarce, bees eat it to survive and sustain them (that includes honey bees and bumblebees). They may resort to eating this sugary secretions of aphids as a substitute for nectar, although it is believed to be not as nutritious for bees as nectar – this is why this behaviour is seen when there is a shortage of food from flowers. Below is a wonderful photograph kindly sent to me by Valerie Nicolson. She says the honey bees really home in on her lime and lemon trees! Here you can see them feeding on aphid honeydew on the underside of the leaves. 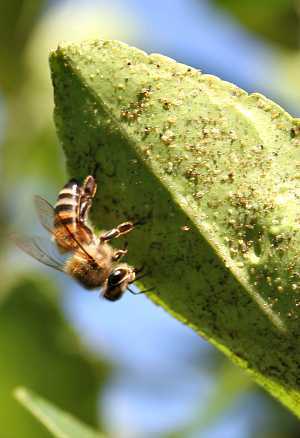 Above: Honey bee feeding on aphid honeydew, by Valerie Nicolson. If you see this behaviour in your garden, please take into account that even if you have lots of flowers, it could be that it would be useful to plant more flowers to bloom at that time of year. This is not always easy, since plants and trees can be unpredictable at times! I have noticed, for example, that the flowering of my cotoneaster seems to have become a little unpredictable. We can only do our best! Also, it's worth taking into account that different bees have different flower preferences. Include a good mix of flower shapes and types for year round nectar and pollen. 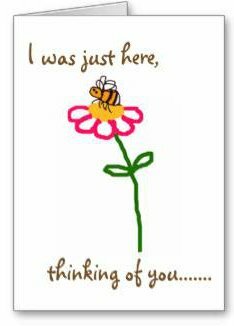 Do bees only eat nectar from flowers? No, sometimes they eat nectar from extra-floral nectaries found on leaves and stalks of plants in the absence of flowers! Earlier this year, I witnessed bumblebees apparently feeding on the underside of green laurel leaves, around the base of the stalk. I should point out that we were in a forest, and at that particular time, there was little in flower. There were a couple of hebes outside the wooden lodge where we were staying, but they were not quite in full bloom, and there was not much else. More than likely, the bumblebees were exploiting the extra-floral nectaries on the laurel plant. This is fairly common: honey bees and wasps will also feed from them, and other plants also have extra-floral nectaries, so that you may even see bees feeding on bracken. A tip for gardeners is this: bees can get quite desparate for food! Please beware that some highly cultivated ornamental plants offer little food benefit to pollinators. As far as possible, try to select plants that provide food for pollinators. 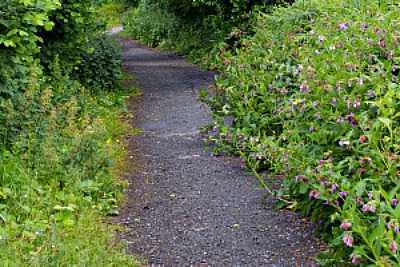 Many herbs and cottage garden plants are great for bees, but there are also plenty of shrubs, climbers and trees. As stated, honey bees may at times be fed sugar by beekeepers, and you can read more about that here. Bumblebees in need of help may be fed a little sugar water to revive them, but it’s very important to use ordinary granulated sugar (do NOT use demerera sugar or artificial sweeteners). Anyone attempting to revive a bumblebee should aim to release it as soon as possible - please do not try to keep it in captivity. In fact, honey bees have certainly been observed many times to eat very ripe fruit, including apples, plums, grapes, peaches, and pears. I have been asked this question, and I certainly know of no example where this is the case. 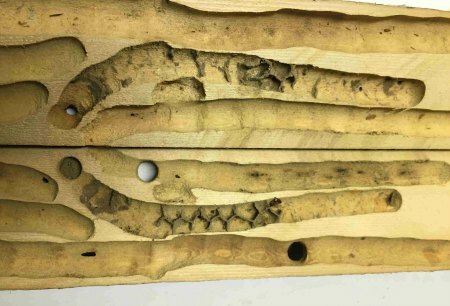 I assume the person was curious because they had been watching wood boring bees or carpenter bees: presumably, they may have observed bees excavating their nest holes in pieces of wood, by chewing and gnawing at the wood. Although it is very uncommon and the vast majority of bees are vegetarian, I am certainly aware of a very small number of tropical species (notably in Panama) which actually do this! You can read more about it on this page. Wasps attack other insects, which they then feed to their young. 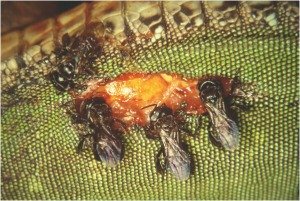 The insect prey provides the developing wasp young with an important protein source. 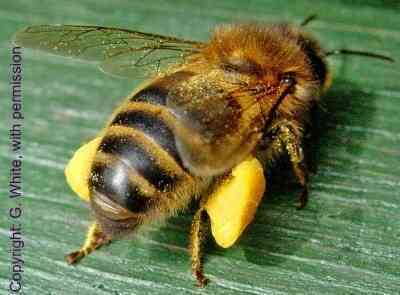 Bees gain their protein from pollen collected from flowers, and this is fed to developing bees. However, again there are exceptions! One of the Vulture bee species – certainly Trigona hypogea has been observed to eat dead insects. Again, you can read more about this on the link 'Do Bees Eat Meat?'. Why do bees eat dirt? They don’t, but I can understand why some people think this is the case. What is happening here is that some species - typically mason bees - are collecting mud with which to help build their nests - but they are not eating the mud. Alternatively, it may also be possible that the bee species being observed is actually excavating a nest by burrowing a tunnel into the ground, but again, the bee is not actually eating the dirt.